There is something about a truffle that most chocolate lovers cannot resist. Perhaps it is the rich, creamy ganache or maybe it is the crisp chocolate coating. Whatever the reasons, a true chocolate lover is always on the hunt for a fun, unique and great-tasting truffle. This list of our top five picks focuses on the Best Truffle Chocolate Clubs – clubs that are guaranteed to deliver delightful truffles every month. 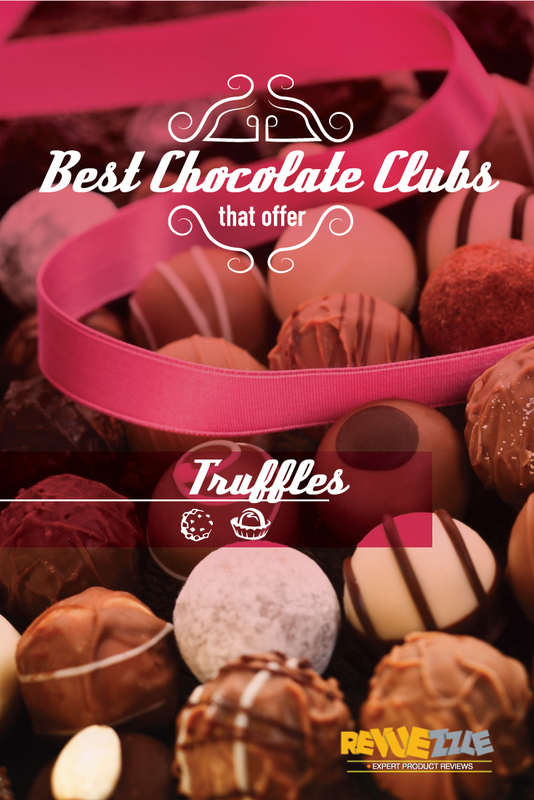 We carefully selected these clubs based on their devotion to those one-bite nibbles of chocolate love and of course, their ability to deliver the best flavors and varieties of truffles. If there is one thing Godiva is best known for, it is their truffles. Luckily, their Truffle Flights Sampler option for their Chocolate of the Month Club ensures you will receive nothing but a hearty helping of truffles for three months. Each month a different variety of truffles will arrive in a six pack. These truffles are expertly placed based on their tasting order – and tasting notes are included. Truffles are never cheap, but Godiva’s Truffle Flights Sampler option does have a remarkable price compared to others. For $60 total, members will receive three months of delectable truffles delivered to their door. What’s included in your truffle selection? The Truffle Flights Sampler features the best of Godiva truffles, including their Dessert Truffle collection, Decadence collection and Milk Chocolate collections. Intrigue Chocolate Co. is known for their truffles, so it is no surprise that they now offer their Truffle of the Month Club – made exclusively for those as dedicated to truffles as they are. What makes this club unique is how they focus on the flavor of chocolate, and then pair it with ingredients from around the world. Their chocolates are exceptional quality and they even use flavors from local farmers’ markets and spice shops – so most members will never see a repeat on their truffle selections. Intrigue Chocolate Co. Truffle of the Month Club is by far one of the pricier options, but for that price, you get access to truffles you will not find anywhere else. The six month membership includes 24 truffles per shipment for $264 total, while the one-year contract includes 24 truffles per month at $528 total. Want to share with a friend? This is what makes Intrigue Chocolate Co. so unique. They package their 24 count truffles in two boxes with 12 truffles in each box. That way you have one for yourself and a box to share with a friend. Intrigue Truffle of the Month - Get This Club! While not all of the shipments from the Gourmet Chocolate of the Month Club are truffles, they do offer a large variety of these little chocolate gems – and their truffles come from artisans located around the world. Signing up for the Gourmet Chocolate of the Month Club means you could be exposed to small-batch truffles you won’t find anywhere else. Not every month features truffles, but they send one pound assortments. Shipments start at $34.95 per month plus $14.00 shipping and handling for a total of $48.95 per month. Want something exotic? This club does feature fun, unique flavors – such as cardamom chocolates, black tea and even wasabi. Visit Gourmet Chocolate of the Month Club - Get This Club! If you are a lover of dark chocolates and truffles, Godiva has the ideal truffle of the month club membership for you. With the Dark Decadence Truffle Flights option, you get nothing but dark chocolate-inspired truffles delivered to your door every single month. Each of their shipments contains six truffles – each expertly selected and placed in their recommended tasting order. Just some of the truffles you can expect to receive include dark chocolate and vanilla mousse, chocolate soufflé, chocolate lava cake, 72 percent extra dark chocolate and the Aztec spice variety. Each shipment includes six truffles starting at $60 total for the three shipments. Shipping is not included and varies. Why a tasting order? Godiva uses their pre-made tasting order because each truffle is placed based on flavor and intensity – ensuring you taste the lightest first. This will help ensure your taste buds are not overpowered by any of the remaining chocolates. Nuts and chocolate come together for some of the most remarkable truffle selections you will ever find. You definitely must be a nut lover to enjoy this truffle club, because there is no shortage of nuts and flavors. Just some of the truffle varieties you will receive include their salted almond truffle, hazelnut crunch truffle, pecan caramel truffle, butterscotch walnut truffle and even the pistachio truffle. The Nut Lovers Truffle Flights Club works similar to the other truffle slight options. You get six truffles each month at $60 total for all of the shipments – but shipping is not included. Want more than just nuts? The Godiva Truffle Flights Sampler features selections from all three flights clubs – so you get the best of all.